This was a friend’s Facebook status earlier this week. And she nailed it. It’s nothing new that anti-abortionists push adoption as a “solution” to crisis pregnancy. I guess they don’t notice that it’s the pregnancy that’s the crisis–for whatever reason–and continuing the pregnancy to a different conclusion doesn’t lessen the crisis, it just creates another. It is the common acceptance that concerns me; that replacing a few letters in a bumper sticker makes everything better. A woman can go from selfish murderer to selfless mother, as long as she’s a birth (relinquishing) mother. Because, obviously, if she even thinks about ending a pregnancy, she would be a bad mother and the baby must be given to others. Because, obviously, her baby would be healthy and wonderful and placed with the perfect adoptive family–preordained by God–and the woman would be at peace with this decision, knowing her child was forever grateful and happy. Because, obviously, this is God’s plan: To force women to act as breeders and give their children away. It’s everywhere in the bible. No, wait. It isn’t. Because, obviously, no matter the actual situation, to be born into a lifetime of pain and suffering is better than being saved from it. That’s why God never causes miscarriage or allows children to die. I’d really like to opine on #3, but will only point out #4, because it once again offers adoption as a “solution,” instead of an equally sad option. Russell Moore declared that “nothing is more contrary to human reason or human compassion” than the argument that it is better for a woman in a crisis pregnancy to abort her child than to make an adoption plan. The idea that abortion is better than adoption, Moore argued, comes from the myth that abortion erases pregnancy. But rather than erase the reality of pregnancy, “abortion simply deals lethally, cruelly, and mercilessly with one of those two people to leave the other deeply, deeply broken.” Moore emphasized that “those of us who have spent years counseling with, loving, and walking alongside people who deeply regret abortions realize” that abortion carries moral and emotional consequences. First, he uses the phrase “make an adoption plan.” That’s a huge red flag, usually meaning he has something to sell. Google his name and you’ll find “Adopted For Life: The Priority of Adoption for Christian Families and Churches.” This was one who Kathryn Joyce, author of “The Child Catchers” decried, and for good reason. Replace “abortion” with “adoption” starting with the second sentence of the middle paragraph. Go ahead, I’ll wait. What he said is just as true for adoption as it is for abortion. And while for some women, terminating a pregnancy or relinquishing a child is like water off a duck’s back, for others either choice brings life-long anguish. No two people are the same. But the likes of “Pro-Life” (AKA “Babies For Profit”) would have you think all women/girls considering abortion are just lonely, and need support long enough to come to the obviously wonderful conclusion: Give up the baby. If they had their way, women would be human incubators, forced to carry children to term no matter the consequences. What do they care if the girl/woman loses her home, her job, her health, her emotional/mental well-being, her other children, her life? As long as they have a womb-fresh baby to traffic, to hold up as a pro-life success story. That is success, as far as they’re concerned. Adoption by any means = Success. Adoption = One less baby aborted. Never mind the two are mutually exclusive. Never mind that often the women who relinquished a child never considered abortion. To pro-lifers, any woman who would “choose life” in the form of adoption are barely a step up from those who desperately seek out a back-alley butcher. They must be saved from themselves. They are not capable of making their own decisions. 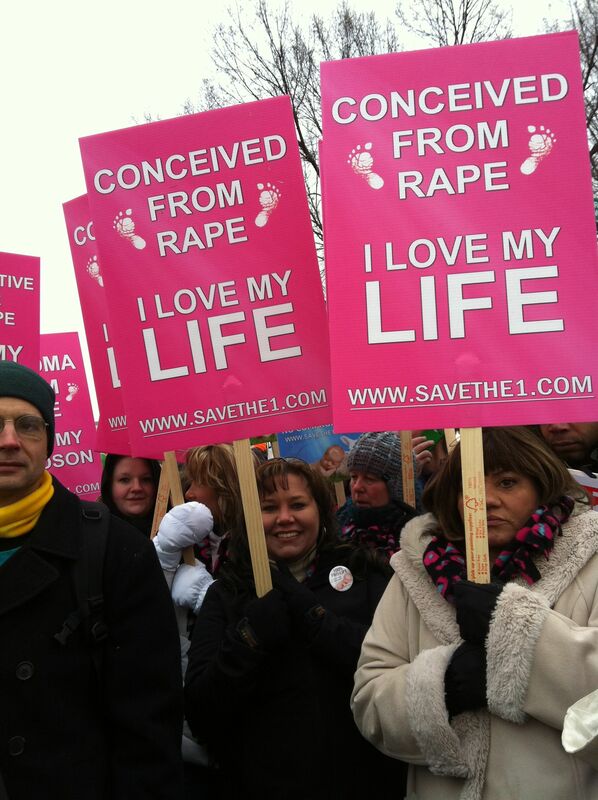 So they march, they hold signs that say, “Abortion Stops a Beating Heart,” and mourn the children who were not born, because clearly these were the ones who would have found a cure for cancer. I’ve never heard of a woman being thanked for saving the world from the next serial killer. The thinking goes, if a zygote was purposefully aborted, that future person would have been exceptional, someone to be missed. But if that same person was born and became a career criminal, it would be the fault of the biological mother, if the child was raised by her or by adoptive parents. Then the excuse is that the mother must have considered terminating the pregnancy and the child somehow knew and resented this and went on a murderous rampage. The “adoptee = one less child aborted” reminds me of the trick faith healers used. To go up front to be healed, the person had to be taken in a wheelchair. It didn’t matter if they suffered from migraine headaches–it they wanted a miracle, they had to arrive for it in a wheelchair. The preacher would point at them and command they come forward, on their feet. When they did, he’d exclaim, pointing, “Is that your wheelchair?” and when they’d say yes, he’d start praising God for the miracle of them walking. One adoptee does not a baby saved from abortion make. This is a no-win statement, leveled at adoptees who question adoption practices. Believe it or not, there are a lot of people who wish they had been aborted, adopted or not. It is their opinion and they are entitled to it. Making sweeping statements that dismiss their deep-seated view only serve to further validate the small-minded people making them. Not everyone is happy, much less grateful, to have been born. Welcome to reality. The annual “March for Life” is nothing more than a rally for wholesale baby harvesting, a clarion call for a new Baby Scoop Era. This year’s theme proves it. Please someone educate that man!